A bike crash victim handed over fake prescriptions to a chemist after he used too much of his medication after his father's death, a court heard. Robert Wyndham (34) used another man's details on prescription papers he said he had found outside his doctor's surgery. Burnley magistrates were told how Wyndham used medication for pain relief and anxiety and depression after he was knocked off his bike and suffered a broken femur a year ago. The defendant told police he had a problem with drugs when he was interviewed after trying to hand over a false prescription at Burnley Late Night Pharmacy for a third time. He had already been successful twice as the two previous prescriptions had been dispensed. The court heard the man whose name was used on the false document believed Wyndham had got his prescription details when he had some food at his home in January. The defendant had 27 previous offences on his record, some of them for dishonesty. Mr Mark Williams (defending) said Wyndham was knocked off his bike, suffered serious injuries, had a titanium rod inserted and was in constant pain. The solicitor added: "Sadly, his father died on January 6th, he took that very badly and took more of his medication than he should have done to try and cope with grief and was left without medication. He filled out a prescription for the medication that he is normally, legitimately prescribed." 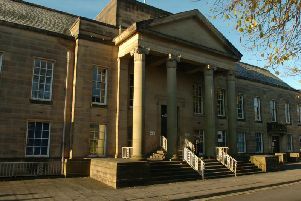 Wyndham, of Rylands Street, Burnley, admitted three counts of fraud by false representation, on January 11th, 12th and 13th. He was given a 14-day curfew, between 7pm and 7am, seven days a week and was told to pay £85 costs and an £85 victim surcharge.